Oooh, you'll post the photos yes? that's amazing! sounds like some fun. and i ADORE your rings/arm candy. Adorable! And loving the jewels and the shoes! I hope you had a good time! Oh godi think im inloved! asiana mag – i'm guessing you're a.) south-asian and b.) you live in the united kingdom, am i correct? 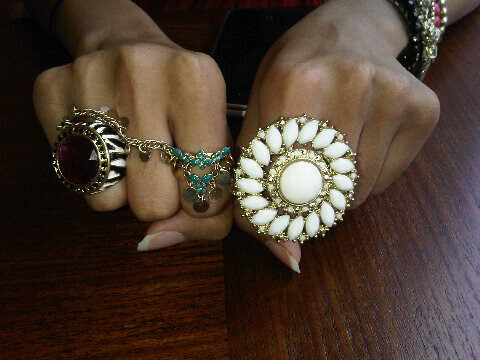 those rings are fab fab! i love them! any idea how much they cost and/or where to purchase them?& the sneak peek of your bracelet is fascinating! care to share 😉 images at the least (lol).also your lace leggings are way gorg! i adore lace and sheer fabrics!the shoes are okay… not really my taste / not really feeling them. Wow those rings are awesome. Nooo those are not stripper shoes at all! I was in Camden in some shoe shop and found a floor where they really were selling stripper shoes. Perspex platformed heels with a ball of fluff on the toe. Yuck. Worse still, people were actually trying them on…and confusingly they did not look like strippers at all! hope the date went well! sounds like a cool day overall 🙂 love your rings!